The AV Greek Festival will take place this weekend, September 21 – 23. There will be closures on West Avenue K-4, between 28th Street West and 30th Street West as follows: Friday 5 – 9 p.m., Saturday 11a.m. – 9 p.m., and Sunday noon – 5 p.m. 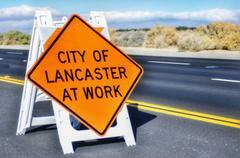 The BLVD, between Sierra Highway and Fig Avenue will close at 7 a.m. on Thursday, September 27. Closures for racing will begin the morning of Thursday, September 27 and be completed by Thursday evening. The closure plan is designed to allow as many streets and driveways to remain open as long as possible on Thursday. However, once the fence installation is complete, access to the businesses between Ehrlich and Date, south of The BLVD, will only be through the special access driveway as shown on the enclosed diagram. The BLVD closure for Friday, September 28 will be from Sierra Highway to Gadsden Avenue. The BLVD closure for Saturday, September 29 will be from Sierra Highway to Genoa Avenue to accommodate the car show as part of the evening festival. The BLVD closure for Sunday, September 30 will be from Sierra Highway to Fig Avenue. All road closures will be removed and access will be restored late Sunday evening.